The goal of the exam is to ensure that you have a knowledge of French “appropriate for the practice of your profession.” This means that the oral and written components of the exam will be related to what you do on a daily basis in your practice: providing care, giving a diagnosis, explaining an illness to a patient or the side effects of a treatment, etc. using the RIGHT tense to correctly situate the action in time, and place the words in the RIGHT order, which means, to construct proper sentences. We will base our program on your work as a healthcare professional, the situations that you frequently encounter, and you will learn to present and develop your responses to questions in a simple and precise way. 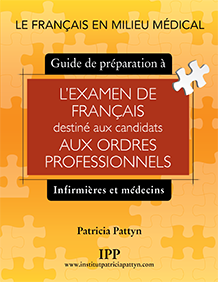 With the help of the Guide that we have written (Preparing for the French exam for Health Professional Practice in Québec: A guide for nurses and doctors), you will be able to strengthen your grammar and your vocabulary through applied exercises and scenarios that will be familiar to you. Communicating with a patient requires understanding what they are saying. If you have difficulties with comprehension then we will propose various resources to help you improve this area which is essential for your success. Pronunciation is also important. We will identify, if it is required, the problems that you are having and will help you to resolve these issues. to apply the rules of agreement. It is difficult to be clear when your response is not structured. We will give you a number of tools that you can use regardless of the subject. There are fundamental rules of agreement which you must adhere to during the exam. In addition, and this is one of the difficulties with written French, we do not always hear the difference between two endings, but the difference exists and will be visible when written. We will study these by means of practice exercises and scenarios. The Guide will give you straight-forward explanations and practical application exercises. The preparation that we offer is practical, concrete and complete. To pass the exam, your responses must be clear and precise. No need to make it complicated!